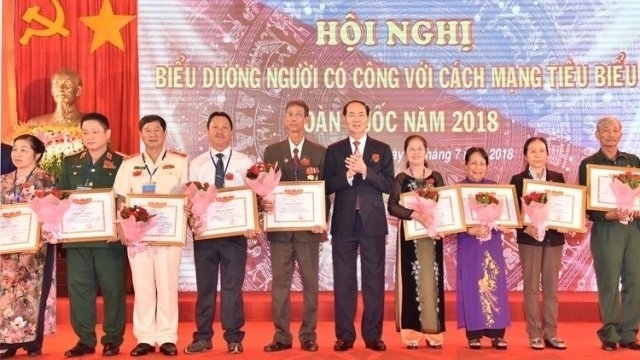 A national conference was held in the southern city of Vung Tau on July 19 to honour those who have rendered great service to the nation, under the presence of President Tran Dai Quang. 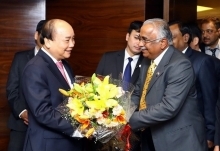 The event was held on the occasion of the 71st anniversary of Wounded and Fallen Soldiers' Day (July 27, 1947-2018) and was attended by members of Party Central Committee (PCC): Minister of Labour, War Veterans and Social Affairs (MoLISA) Dao Ngoc Dung; Chairman of the Presidential Office-Minister Dao Viet Trung; and Nhan Dan Editor-in-Chief, deputy head of the PCC Communication and Education Commission and Chairman of the Vietnam Journalists’ Association Thuan Huu. This year’s conference honoured 355 outstanding war veterans, heroic Vietnamese mothers, Heroes of the People’s Armed Forces, ex-youth volunteers, and relatives of martyrs and revolutionary contributors representing more than nine million national contributors around the country. 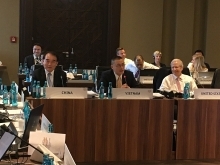 Speaking at the conference, President Tran Dai Quang expressed his profound gratitude and conveyed his wishesfor the good health of revolutionary veterans, Heroic Vietnamese Mothers, wounded and sick soldiers, martyrs’ relatives and revolutionary contributors. The State leader affirmed that the Party and State have always paid great attention to directing the implementation of the work of showing to national contributors. He also asked the central ministries, branches and localities to continue to complete preferential policies supporting contributors to the nation. According to a report by the MoLISA, over 9 million national contributors have been identified, comprising more than 1.2 million fallen soldiers, 127,000 Vietnamese Heroic Mothers and over 800,000 wounded soldiers. 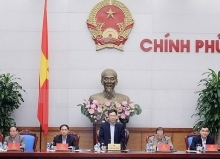 Policies in support of people who contributed meritorious services have been implemented by ministries, agencies and branches at all levels with a total annual state budget of more than VND30 trillion.